At the end of a busy day, all you crave is the comfort of your home and an easy to prepare home-style dish that everyone in the family loves. Paleo pizza with cauliflower crust makes for a nice slice, every once in a while, as you can customize the toppings to your (and everyone else’s) likes, but one can only eat so much pizza. Get back to the basics and bake meat and potatoes, once again, as your main dish. To make it Paleo, you may want to hold back on white potatoes, in favor of sweet ones, though there is nothing wrong with switching it up – you can even use one of each if you like! 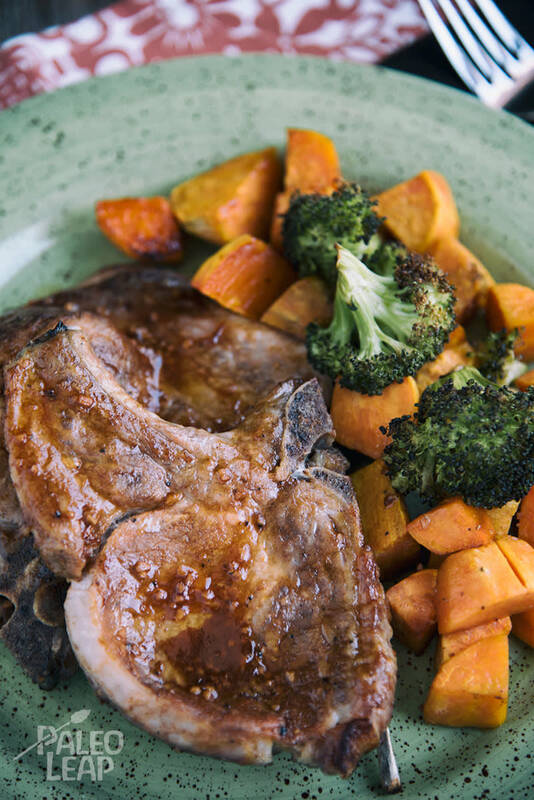 Once you have prepared the pork chops, diced the sweet potatoes and chopped the broccoli florets, you’ll want to start thinking about a side dish to complement this uncomplicated, yet scrumptious meal. Automatically, our minds race to homemade applesauce, on the tart side, with a generous amount of cinnamon and a pinch of grated nutmeg. Consider adding some coconut fat instead, applesauce is wonderful when enriched with coconut cream, which leads us to think about baked apples with whipped coconut cream – that is a luscious idea as well. Let your thoughts race back to dinner, in about 20-25 minutes your pork chops are done in the oven, ready to serve in good time to the hungry guests who have gathered around the table. In a bowl, combine the ketchup, chicken stock, garlic, apple cider vinegar, and coconut aminos. Season the pork chops to taste with salt and pepper. Pour the mixture over the pork chops, making sure they are well covered. Drizzle the avocado oil over the sweet potatoes and broccoli, and season to taste. Place the pork chops in a baking dish and surround with the sweet potatoes and broccoli. Bake in the oven for about 20-25 minutes depending on the thickness, or until the pork is cooked through and sweet potatoes are soft. Pork is done when the temperature reaches 145 F.